Learning x-country skiing. It’s great fun and heart healthy. "There are four basic food groups: milk chocolate, dark chocolate, white chocolate, and chocolate truffles." Learning x-country skiing is excellent for the heart. But it is not as easy as it looks. First you must learn to balance yourself on skis that are six feet long. Then you must learn to push yourself along over hills and dales. Most importantly, you must learn how to ski down a hill where a devious trail designer has placed a turn at the bottom. It’s may look easy but prepare to pick yourself up quite often out of a snow bank. Some years ago my wife, Irma, and I set our course on learning x-country skiing. Some of our friends were doing it so we thought, why not us. Not being the guy who takes advice readily, I went out and purchased cheap wooden skis, bindings and boots. You would think that having read many hundreds of advice articles on purchasing outdoor equipment I would have learned something over the years. Not exactly. I find it easier to give advice rather than to learn from others. Let’s start with the skis. There are basically two materials of which skis are made. Wood or fiberglass. There are also two types of skis. Wax and non wax. Some people refer to non wax as fish-scale skis. Not all wooden skis are poor quality. Some of the best wooden ski makers in the world are in Norway. They are nice and wide and are great for breaking trail. These skis must be waxed thus another problem comes into play. Fiberglass skis come in waxable and non waxable. Waxable fiberglass skis are used by racers who need speed and grip control for every temperature gradient. The wax is applied to the bottom of the ski and is used to push against the snow and is not used to glide. 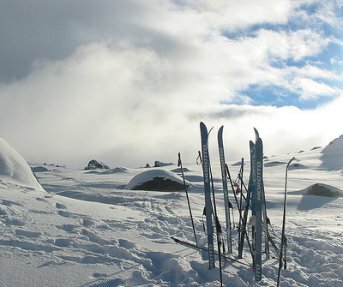 Almost every recreational skier today uses fiberglass skis with fish-scale bottoms. Now back to our cheap wooden skis. Irma and I were trying to teach ourselves to ski. We think it is the best method of learning x-country skiing.We were attempting to cross a creek. A narrow wooden plank had been placed there for that purpose but was too narrow for the skis. Irma crossed over and I threw one of her skis over and it broke completely in two pieces. Next trip, the bail holding the ski-boot to the ski flipped out and disappeared into two feet of snow never to be seen again. We were coming to the conclusion that the cheap road was the wrong road. I then purchased a pair of those top quality Norwegian wooden skis. They worked beautifully. Well, that is, until I did it again. What is that expression, "the older we get, the dumber we get." This time I tried to break out a large chunk of snow with the back of my ski. We needed something to stuff in a hole in our shelter to shut out the wind. Then we could boil some water for tea during a cross country ski trip. My good wooden ski snapped off an inch behind my boot binding. Not very smart. Finally we purchased fiberglass skis with fish-scales and good bindings. We then set our sights on learning x-country skiing. We taught ourselves. Because we didn’t have the luxury of groomed trails we had a problem making a 180 degree turn. We would come to a dead end area with a fence barring the way. Keeping our balance while turning one long ski at a time was tough to do. The proper way to turn while at a dead stop was to balance on the left ski while lifting the right ski and laying it down in the opposite direction and maintaining your balance, bringing the left ski around to parallel with the right. We soon found some groomed trails to practice our skills. Place your skis in the tracks and push off. It’s only a matter of keeping your balance. That will come with time. Where the going gets tough is when you encounter a hill. Going up you must herring bone. You place your ski out from your body at an angle and bring the other ski out at the opposite angle and do this maneuver repeatedly until you reach the top. The toughest challenge to master is descending a steep hill with a turn at the bottom. Track setters generally leave an area from the middle of the hill to the bottom without a track. This allows you to step around the turn in little steps. Almost like ice skating or roller blading. Try to keep the majority of your weight on the inside ski. This maneuver is one of the toughest lessons in learning x-country skiing. Learning x-country-skiing is great aerobic exercise for your heart and will keep you in a wonderful frame of mind as you roam the country-side.